Tackless II is a CSY 44' sailboat in its tenth year cruising the world. 15-25 November 2008 - Busy, Busy Busy…. There wasn't even a flicker of recognition here in Australia that November 27 was a major US Holiday, although I did see a snap of President Bush holding up a naked turkey body, which was an odd photo to show with the story of him giving the annual gobbler pardons. However, I am fairly sure that photo was on US Yahoo. I was determined not to let the day slide by and had been searching for a turkey to roast. I finally found a 3.5 kilo bird on the bottom shelf in the frozen food section, but I wasn't quite sure which day I would roast it – Thursday, by the calendar, or Friday, when everybody back home would be celebrating. In the end I didn't roast it either day. Thursday morning, just as we got back to the boat from our now regular morning walk, we got a call from Randy and Sheri of Procyon. 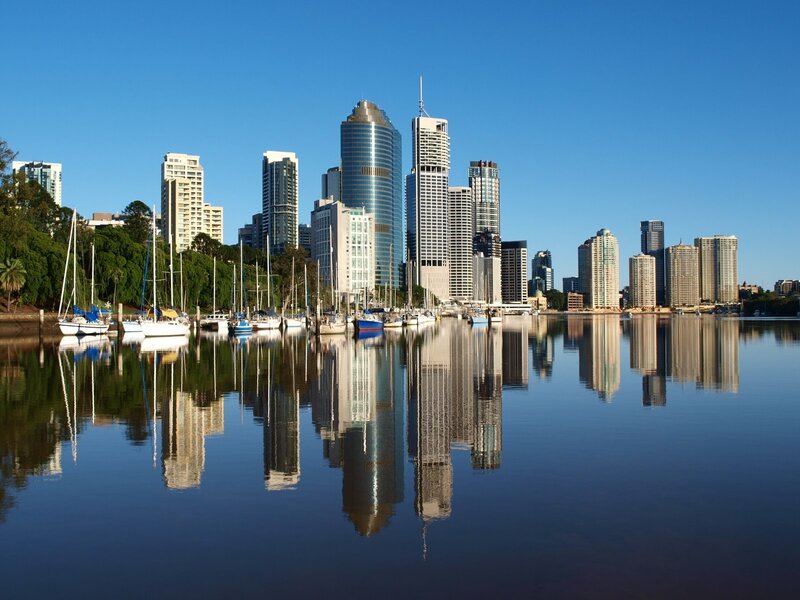 "We are anchored in the river right where it goes through downtown Brisbane and it is so cool. You should get on the train and come down!" And so we did. Just like that! We threw tooth brushes and a change of clothes into the backpack and then stepped out of the marina to the corner where we caught the 615 bus that carried us to Landsborough Station, from where we easily hopped on the connecting trains to downtown Brisbane's Central Station. It took just two and half hours to make the trip, and as, we popped out into the sunlight, Randy and Sheri were waiting for us! Talk about culture shock! From laid back Bundaberg, to sophisticated Mooloolaba, to supercharged downtown Brissie! We emerged from Central Station at the corner of Edward and Ann streets (Brisbane's streets are named after British kings and queens – queens go one way, and kings go the other!) and gazed downhill at an urban landscape of ultra-modern buildings mixed most satisfyingly with beautifully preserved old stone ones from the 1800s. Eight miles up the Brisbane River from Moreton Bay (another wedge of water trapped between the mainland and an offshore island), the city of Brisbane started life, like so much of Australia, as a penal colony, specifically one for difficult convicts from the Botany Bay colony farther south in New South Wales. But eighteen years later it was opened to free settlers, and in recent decades it has become one of the most popular places in Oz to live. The city center is caught in a couple of deep loops of the river, and Procyon was anchored in the main stretch between the Story and Captain Cook bridges, right off the beautiful City Botanical Gardens. On the opposite side of the river the steep red Kangaroo Point cliffs rise above a long strip of parkland. The cliffs are spotlighted at night, so with the cityscape on the one hand and the cliffs on the other and bracketed by the two bridges, the anchorage was a very dramatic spot to sit. At the foot of Edward Street is the city "marina" a string of parallel piles to which was moored a very motley assortment of long term liveaboards. Procyon, virtually the only cruiser anchored there, was definitely the classiest vessel in sight. Upon our arrival, we had a delicious lunch in the Pig & Whistle café in the middle of pedestrian-only Queen Street, and then spent an hour or two wandering the streets, poking our noses in a few stores, generally agog at all the glitz of full-bore civilization. Preparations were underway for various Christmas events, including the lighting of the city Christmas tree and a carol concert in a few days. As the feet and energy wore down, we found our way to the dinghy dock along George Street which borders the Botanic Gardens on one side and opulent buildings of old stone or new glass on the other. The views from Procyon were stunning, especially as dusk approached and the city lit herself up. We enjoyed a few relaxing beers in the cockpit, watching kayakers from the Riverlife Adventure Center drop two dozen kayaks into the river for a slack-tide paddle before the current of the changing tide pulled them back and turned Procyon right around. There is regular ferry service up and down the river by fast power cats creating occasional wakes, and the river water, I'm regretful to say, was not pretty. We all agreed it was about the color of Fijian kava, which is to say milky brown. This was especially aggravated by the unusual spate of rain the region has had the past few weeks. We dined that evening at the Café Mondial, not so much out of choice, but because many of the restaurants we checked out were closed for private parties! Early Christmas parties? I guess when you don't have the Thanksgiving barrier, you can start celebrating as early in November as you want! According to the newspapers "Australia" has not done too well in its first week, and reviews are mixed. This is always painful after a huge publicity campaign. And the fact is the flick is more than a little hokey, particularly in the beginning. One wonders what Luhrmann was aiming for with the almost caricature performances from his leads in the opening scenes. This is not good in a three-hour movie! Fortunately, things seems to settle down after about the first third, and the whole thing is saved by the believable performances by the Aborigine actors, particularly the enchanting central character of Nullah, a mixed race child of great resources and connection to his Aboriginal heritage through his grandfather, the mystical and mysterious "King George." Watching hunky Hugh Jackman (especially after the ridiculous early scenes) is no chore, either. What's really surprising about the movie is that despite a fairly predictable script and some rather one-dimensional characters, the subject matter of Australia's historical racism is bluntly addressed. The absurdity of that racism and the grandeur of the landscape are the movie's two most successful messages. So all in all, we would say it is worth going to see on the big screen, with the proviso that you don't want to give up on it before the cattle drive starts! From the movie we hopped back on the train, which was much more crowded on the ride north, being as it was Friday afternoon, than it had been on the way south. I must say that our train rides both ways were pleasant experiences thanks to friendly Aussies who were keen to chat us up. On the way down it was Dennis, a 30-year employee of the train company, who not only assured us we were going the right way and making the right connections, but shared with us a lot of information about the landscape we were passing through, (much of it dedicated to fruit production – ranging from pineapples to strawberries to lychees! – that all used to ship by train and now ship by truck,… tsk, tsk) not to mention all the side trips into the Sunshine Coast hinterland that we shouldn't miss. One of the highlights from the train window are the unusual Glasshouse Mountains. In total there are sixteen of these shark's tooth-like crags that stick up abruptly from the flat green surrounds like rocks from the sea. Of ancient volcanic origin, they are what remains after millions of years of erosion. The train passes right by three or four of these, and Dennis assured us we could climb one we were sufficiently motivated. It looks to us to be more like rock climbing than a morning stroll. On the bus link from Landsborough Station back to Mooloolaba I finally got my wish to see kangaroos in the wild…in the suburbs no less! The first sight was a head peaking up over the raised bank as the bus whizzed by. I exclaimed and Don glanced out over his should in time to see a whole pack of about eight in an open area under some power lines. Only moments later the bus turned into a university campus and we saw a large kangaroo sitting on his own in the middle of a playing field! Clearly late afternoon is the time to see them! Although the turkey was now thoroughly thawed in the fridge, I still couldn't cook it on Saturday because Saturday was the annual Mooloolaba Christmas Boat parade. Even though it is summer here, it does not stay light late on this coast because Queensland does not adopt daylight savings. We have observed that one big plus of this is that Queenslanders get up early to swim, surf, walk, jog, and kayak before work rather than after. However, another perk of the plan is that it is dark enough by 6:30pm for Christmas lights! We watched the parade from Lionheart in its end berth at the Yacht Club Marina, giving us a great vantage point as the line of boats passed us several times. Our last boat parade was with Diane and Alex in Hernando Beach, FL where the temperature was in the forties! This was much warmer! The best boat by our vote was a neighbor from the Yacht Club who had turned his mast into a giant sparking candle with, somehow, a flame at the top. This would go "out" at intervals and a "match" would ascend and relight it. I have to assume this was some kind of commercially produced decoration, but it sure was perfect for a boat application. Of course the other highlight of the evening was playing with Tricky and Jane's new two-month old puppy, Dudley. Dudley is a chunky white guinea pig of a pup whose Daddy was a Maltese and whose Mum was a Staffordshire Terrier (pit bull to us gringos). Clearly Daddy was a bold and brave fellow! Duddles, as I prefer to think of him, has Dad's wispy white hair, but he has Mum's more solid build with a bunch of black spots showing through his coat.. He is pretty cute…now. The Turkey finally went in the oven midday Sunday, which turned out to be the right day because both Tricky and Jane and Peter and Sandy were able to join us. Don went to help Tricky build a bed in their new van, which left me alone on the boat all day to cook at a nice leisurely pace so both of us were pretty happy. Everyone (including Duddles) assembled on T2 at about five pm, Sandy bringing a salad and Jane bringing a cheesecake and berries for "pudding." There was wine, beer and bubbly to wash it all down, and I must tell you that there was not a crumb of anything left! Despite the economic blues, despite that fact that we are putting the boat on the market, and despite the fact that we are still far from family at this holiday time, we still have a great deal to be thankful for. And we are. Written at 12:19 AM by Gwen and Don. May I have permission to use part of one of your photos on a web site I contribute towards? or Posts by Topic links in the upper left! Pictures and text copyright 2009 Gwen Hamlin. The Blog Template is generated via PsycHo and is Licensed.